The Nixon Rubber Player: Style & Functionality | DressCodeClothing.com's Official Blog. Not to be confused with the 37th president, the watch brand Nixon has had a meteoric rise in popularity over the past few years. The Player line is one of Nixon’s more popular and versatile styles. Nixon’s first couple runs were encased in a polyurethane and silicone material (fancy for rubber) from the case of the watch all the way to the band. 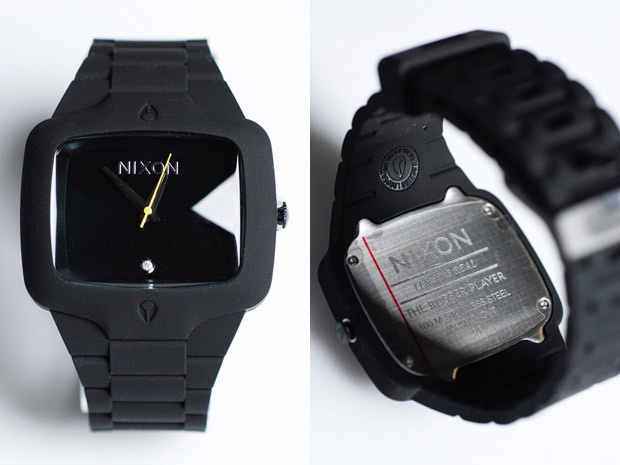 The first Nixon watch I ever purchased was the Matte Black Rubber Player and has stood the test of time. I love wearing this watch for a snazzy dinner, or when I’m going to class or even just at work. But don’t let the rubber design fool you. The clean face accompanied by the real diamond marking the six hour spot coupled with a chrome finished Nixon label at the top of the face really adds a nice shine to the piece. The great thing about the player is it comes in a range of colors, accents, sizes and materials like brushed steel. For the high rollers there’s a ceramic model with a real ruby instead of a diamond that will set you back $1,500.